Strengths: Glacius has excellent full-screen zoning options include a bouncing projectile that does not disappear if Glacius gets hit, a nearly full screen unblockable attack, and superb jumping normals that can take up the entire screen. He also has surprisingly strong corner control and up-close pressure game in an archetype that usually struggles in close-range fights, coupled with extremely high damage output, especially when an opponent is locked out. Weaknesses: Like most zoners, Glacius has poor mobility; namely, his walk speed is very slow, and his jump is high and floaty with no ways to alter trajectory in mid-air. He has a hard-hitting reversal, but because it has slow startup and does not rise off the ground, it has a harder time stopping neutral jumps and some other types of offense. He also has a tall hitbox which puts him constantly in the way of attacks other characters can avoid. Notes: Glacius has some oddly specific counter break combos. The no-meter variation is able to squeeze a heavy linker at the start and still not run out of lockout time; doing so will gain you an extra 2% damage. Despite Puddle Punch being Glacius's damage linker, Shatter linkers do exactly the same amount of damage and are a hair faster; they are mandatory for the 1-meter combo, because Puddle Punch linkers allow shadow Cold Shoulder to be broken at the end. The 2-meter combo benefits the most from two shadow Cold Shoulders, but needs a medium auto-double after the first two linkers to fit. It is quite a bit better than using shadow Puddle Punch as an ender, though, so it is worth remembering. Shatter is an unblockable projectile which spawns at three distinct points on the screen, like SFIV Viper's Seismo Hammer or SFV Necalli's V-Skill, and only hits grounded opponents. It can be thought of like a long-range command grab, since it beats blocking and loses to jumping, and it has high recovery similar to a command grab as well. Glacius will have to be careful using it; either have a Hail out for protection, or be ready to anti-air regularly, since players will regularly jump against Glacius due to the Shatter threat. Couple that with Ice Lance, a fast 2/3-screen space control normal, and Glacius rules the mid- and long-range game. Ice Lance is one of the few normals in KI that acts directly as an opener, transitioning to auto-doubles or linkers immediately. When Shatter and Ice Lance hit at a distance as openers, Glacius will begin using ranged auto-doubles; there are only three instead of six (P and K will do the same double) and they are breakable under all the same rules, but they do a lot of damage and raise the ender level fast. Always input a linker or an auto-double after your Shatter or Ice Lance so you can convert combos should they hit. Since both Shatter and Ice Lance are risky from close range, Cold Shoulder is his go-to safe pressure move. It is a very fast-traveling horizontal attack that works great to check your opponent, especially when canceled off Ice Lance. The heavy version of Cold Shoulder is unsafe, so you should use it sparingly. Only the light version of Puddle Punch can start a grounded combo; unlike the heavy version, the light version is briefly vulnerable for the first 3 frames of startup, which makes it difficult to use as a reversal. If your opponent is not tight with his offense, however, the occasional light Puddle Punch can sneak through. Hail is Glacius's main space control special move. After summoning an ice ball behind his head, Glacius can hold it in place by keeping the punch button held down, while taking any other action including movement and other attacks. Releasing the punch button will send Hail at a downward angle dependent on the button used. Notably, Hail does not disappear if Glacius is hit, making it useful as a shield which can interrupt an opponent who hits Glacius, as long as the opponent is not projectile invincible. Glacius can also summon multiple Hails at once by holding different punch buttons immediately after the first special move input. Mix and match your Hail strengths and release them with different timing to make your opponent's approach difficult. Like other projectiles in the game, if Hail hits your opponent, you can start a combo by using a manual. Glacius can combo off any throw in the corner, since he has enough frame advantage to time even a heavy manual. If you are from farther out, but still near the corner, try an Ice Lance manual, or attack with Cold Shoulder. You'll start with high KV, though, so your combo will have to be short. If you're far enough away that Ice Lance is your only manual option, the defender might try to combo break with MP+MK often. In this case, you should occasionally sprinkle in a Shatter reset instead of doing an actual manual. At long range, Shatter is the only linker that will connect, so it is probably Glacius's most common linker. If you decide to mix in Shatter linkers at close range and you use the light punch button (to try a light or heavy version), but you mistime a manual, you'll get an unblockable reset that the opponent must be on point to avoid. Puddle Punch and Shatter linkers do similar amounts of damage, so they can both be used in lockout situations, but if you drop your combo and attempt a Puddle Punch linker, you will get a very unsafe on block move, so be careful. Shadow Cold Shoulder hits 5 times very fast, which lets Glacius squeeze in two shadow linkers after several heavy auto-doubles before the opponent recovers from his lockout, which can lead to 60% damage or more. This is one of Glacius's best uses of meter; you shouldn't hesitate to throw at least one shadow Cold Shoulder in the middle of a combo when you see a lockout. 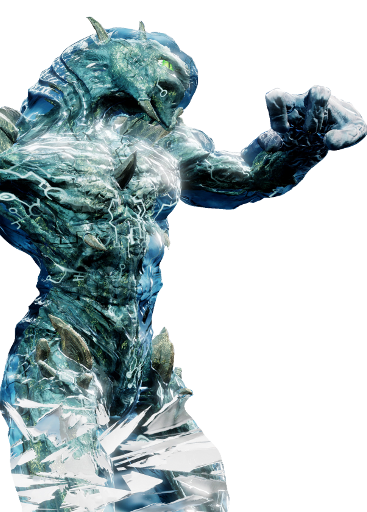 Glacius is the only character in Killer Instinct who has no lockout gaps between hits in any of his shadow linkers. As long as you don't get locked out between the freeze and the first hit, you can mash to your heart's content and never fail. Shadow Cold Shoulder is almost instant after the freeze and nearly impossible to lock yourself out, even if you are deliberately trying to. Against average-sized characters, Shadow Hail has a significant gap that you need to wait out before trying to break, but this gap will be less against very tall characters since they get hit by the hail earlier. In general, delay your first break attempt to have the most success. Shadow Hail is uncommonly used, however, since it is a bit more finicky in combos and shadow Cold Shoulder acts faster and does more damage. Glacius's long-range Shatter ender is his battery ender, which ensures Glacius is always full of meter, and he can spend some meter on Shadow Shatter to end a combo for more damage if he chooses. Puddle Punch is an excellent damage ender, and shadow Puddle Punch is a decently damaging cashout move that lets you perform a brief juggle after, such as Ice Lance canceled into Hail for future offense. Similarly, the Hail ender sets up a ground bounce, which lets Glacius summon a free Hail; if the opponent is cornered, they will wake up with a Hail hovering above their head, which lets Glacius attempt a free mixup that is difficult to punish or interrupt, including some tricky fuzzy guard setups. Glacius does not have a flipout or recapture move, so his juggles (for example, after some enders) tend to be very short and are useful just to set up a Hail. Glacius instinct has two main benefits. First, he summons ice armor. A new piece of armor regenerates 3 seconds after the old one is destroyed. This serves Glacius well for numerous reasons. It strengthens his zoning, since one hit will no longer trade with or beat any of Glacius' ranged attacks, and it gives Glacius a way out of certain types of pressure, especially jumping attacks if Glacius whiffed an attack with high recovery, like a throw. Because armor loses to heavy grounded normals, it will likely not protect Glacius from punishment if a Puddle Punch is blocked, since a smart opponent will just press a heavy button to start a combo in this case. The other benefit Glacius gets is high mobility. Liquidize now travels considerably farther and much faster, which can make for some deadly left-right mixups after Glacius summons a Hail, and allows Glacius to reposition himself much more easily. He also gains access to an instinct-only attack called Homing Puddle Punch by pressing HP+HK; this non-invincible attack looks like Puddle Punch and will quickly travel from anywhere on the screen until Glacius is right in front of you. If you hold forward while pressing HP+HK, Glacius will cross you up by attacking from the other side! While both attacks are very unsafe, when covered by Hail, Glacius gets to perform some gross mixups. If you are on the receiving end of this, you might want to try neutral jumping and attacking on the way down, so you don't have to guess which way to block. At mid-range or further, Ice Lance is Glacius's main normal. Opponents will run into this move often, and while it is -4 on block, it is very difficult or impossible for most characters to punish when used at most ranges mid-screen. Your opponent will be able to walk forward a bit and close the gap slightly after blocking Ice Lance, but it is still an extremely powerful mid-range combo starter for Glacius. When not using Ice Lance, Glacius might want to retreat by doing a normal while jumping backwards. All of Glacius' jumping kick normals hit at different angles, but have huge hitboxes that can make catching a jumping Glacius via grounded or aerial approaches difficult. Since anti-air is so important to Glacius, both crouching HP and Ice Pick ( +HP) are excellent anti-airs that can either be canceled into Puddle Punch for damage, or Hail to give Glacius space control. If you're fighting against Glacius, you need to learn to jump Shatter on reaction, otherwise you'll get tagged with a lot of unnecessary damage. Jumping pre-emptively into Glacius will make you eat anti-air damage, though, so be careful. Glacius really wants to use Shatter in combination with Hail, so that people who jump over Shatter still have to contest with Hail. This is particularly effective when Glacius is able to summon multiple Hails, but this is not easy because lots of characters can use projectile invincible moves to tag Glacius if he tries to summon at bad times. In general, however, stopping Glacius from summoning Hails while dodging the wall of Shatters and Ice Lances is difficult. Hail is also useful for complete corner control. If you summon a Hail over someone's head and hold it there, you can mix them up while they squirm, including a throw or an unblockable Shatter. Liquidize (press and hold all three kicks) is a unique non-hitting move that is projectile invincible at the beginning and fully invincible while in puddle form, which is useful in projectile wars or up-close gimmicks, but is punishable as it rises and can't be used as a reversal. Instead, Glacius should use heavy Puddle Punch as his get-off-me move, which is a very hard-hitting and fully invincible attack. Canceling heavy Puddle Punch into shadow Hail from close range will be a tight block string, keeping Glacius safe for the cost of one shadow meter. The farther away Glacius is from his opponent, the better he is. Making the opponent run the obstacle course of Shatters, Hails, and Ice Lances will get you a lot of damage, and you can run away with his excellent jumping kick normals. Be on point with your anti-airs (crouching HP canceled into Puddle Punch in particular), since the threat of Shatter makes opponents extremely jump-happy in this fight. Light Cold Shoulder is safe on block (the medium version too, from most ranges), which gives Glacius surprisingly acceptable close-range fighting ability, but it is usually only temporary until Glacius can find a way to reset the distance. If you manage to corner your opponent, finish with a Hail ender, then hit them with a normal like standing MP after the ground bounce and bring out another Hail. There are many creative mixups to be had here, especially since crouching LK (low), jump-back kick normal + Hail release (instant overhead), Shatter (unblockable), and throw will all lead to a full combo, and your opponent will not be able to challenge you with buttons, since Hail will catch them even if they hit you. Show me a vengeful grappler.